Are you ready for change? Need a little inspiration in your creative endeavors? Are you ready to get moving on some fitness goals? Then sign up for a free session of coaching and see how you like it! Not only will you get a free introductory session, but you will also get a second session for $10.00. Two sessions for ten is a steal of a deal. Are you ready to do some shifting? Is there a dull nag in your soul that needs you to hear it loudly and nurture it? Please don’t hesitate any longer because you deserve to be happy and fulfilled. Sign up now by emailing thesilentmoon_speakstome@yahoo.com. I finally got the art bus and can’t wait to get going on the conversion. What do you think? It came with 20 years of five star mechanic records. It pays to buy from federally funded programs because they are required to do regular maintenance on their vehicles. I am so excited!!! I am at a precarious place in my life. Two of my dreams, and one life path that I have been working towards goals on, are all completely different from each other and all inviting to choose which direction I will go down. Each decision will change my destiny greatly, and I am confused as to what to decide. I will break it down. It is a life long value of mine to travel. Transformational travel is on my radar to expand to in this Life Coaching business because when I traveled with Ren fairs, I learned that I will never have to be stuck in a situation because there are so many options to choose from in life. It is a huge value for me to pass this on to my child. I want to show her that she too can move around and learn from the world. I want to show her the world is a kind place, that if she has faith in herself and in humanity, that wherever she is, so is her heart. Well I recently have an opportunity to travel with her. One huge value and dream to show her life by living it, not reading about it, is staring me in the face right now. Right now, I must decide quickly if this is the path that we will live for the next year. If chosen, I will commit to a full year of traveling with child. She will school online and we will live our life learning and being in close relationship with each other which I long for deep in my soul. Another life long dream of mine is to own a ranch where I can teach the arts, creative movement, writing and equine healing to youth. I right now have an opportunity to buy a ranch that is affordable to start the program of my dreams. This is a dream that I have been wanting since I was a child; much like the dream of traveling since a young person. I have never been so close to realizing this dream before. They are merely waiting for me to say the word. The only draw back to this dream is that I will be very committed and will not be able to move around freely because animals never take a vacation. They have to eat every day, the program will need work every day. Youth will need programming every day and personal freedom will not be an option like traveling with daughter. I could stay exactly where I am at. I am finally participating in art shows, I have time to paint, parent, and play music. I am working on Wellness Coaching Certification and do have time to spend on getting my Coaching business more marketing opportunities. I can still do this on the road and at the farm but I have adjusted to the life I am currently living. The only drawback to this plan is that I have to work four full time jobs to keep it going and I am tired of being pulled in so many directions all at the same time just to make ends meet. I do not know what to decide but I am inclined to choose the path of the most freedom. The farm’s freedom would be that I could live in the country and be around horses and give that gift to youth that may not have the opportunity. Traveling’s freedom is that I would not have bills so I could spend more time with child which is my number one value, and staying put’s freedom is I already know it, I have time to paint, work on my art and music, and work on my coaching business although I feel scattered by my too many jobs. What a hard decision but I AM BLESSED!! I AM GRATEFUL! You can make it look however you want to. For me it’s easier to look at something because I am a visual person but you have your own ways that work for you. I would love to discuss this with you also. Sharing and comparing is very helpful for support and motivation. Good luck with your crossroads! Isn’t it wonderful to have so many options? Don’t forget to be grateful on your journey. It can make the day so much better and removes personal barriers so that you can help others who are shifting and changing as well. Just two days into fall and it already feels like it is. This is a great time to announce “Bring Back the Light” special through the month of November. This is the time of year that our brains and bodies go into hibernation mode so I would love to offer a 10 % discount to new coach-ee’s who would like to keep a forward momentum through the fall. Winter is not a time for hibernation, it’s a time for cultivation of spirit. Let your dreams manifest over the next few months by honing in on your one and five year plans. Set aside time to navigate your goals to get ready for spring launch. Don’t hesitate to call for your free complimentary session. It takes only a half hour and you can gain valuable skills to tackle a problem that you need help getting moving. You are valuable and deserve to be vibrating at your highest so pick up the phone and call for your session. Happy August! How is your summer going? I have a few shenanigans on the horizon. Starting in September, I will be teaching a “Writing For Healing” class through community education. If you are interested, please email me and I will send you the information on how to sign up. The cost is $40.00 per person and includes three sessions of writing prompts and assignments that follow each class. We will be using memoir and journal techniques to flesh out possible subjects you may be interested in developing. Look for my painting “Broken Dream” to be displayed at the “Clean” show which has moved from a venue to online this year. This exhibit is hosted by Your Arts Desire http://www.yourartsdesiremtka.com/ and features artists who tell their story of recovery and sobriety through works of art. I will post details as I am informed of them. The art bus is coming along nicely. We managed to pull the seats out and started painting her. Her name is “Kismet” because I still believe in magic. Thank you for tuning in for an update. It’s been a busy summer as I have had a lot of opportunities to display my artwork and the July twofer sessions went very well also for the sample coaching sessions. I will be giving away another coaching session for the last two weeks of August so stay tuned for that as well. I hope you are enjoying your summer. I just wanted to check in and say hello to everyone. I am full for June but I am looking to add one spot for a new coachee in July so if you know that you are worth living your life built from passion not regret, you have goals that you want to achieve and need a little help getting there, if you want some balance in your hectic schedule, or if you have a burning desire for change and are unsure where to start, you may benefit from having a personal coach. I will help you define your short and long term goals. I will help you get clear on your values and hold sacred space for you while you reflect on living your values. We will have weekly check in’s. We will co-design your plan of action. I will not tell you what to do. As a coach, I am trained to ask you important questions that will get the gears of your engine turning. We don’t focus on the past but we create a present and future worth living for. You will learn tools that create movement in your life; tools that you can use at any time once they become habitual. I am a creative artist and have the ability to hone in on your individual learning style and will cater my coaching to fit your unique life and person. Are you ready for change? Then what is stopping you from placing that free coaching call? I know you are worth living your life for you, not someone else. You are worth feelings of contentment and happiness. You can live the life that you have always dreamed of by making thoughtful decisions and actions. Make it count! Make the call! I am looking for two people who have the desire for changing some habits and want to create at least three long term, and three short term goals. I will give you a free half hour intro to coaching session so you can decide if coaching is for you. If you decide you are ready for change, I will give you an additional 25% off of your first four sessions for the month of June; no commitments until you decide coaching is for you. Please email me at thesilentmoon_speakstome@yahoo.com if you’re interested. In 2013 I was heading towards a destructive path quickly. I had suffered a couple of great losses that lead to using alcohol to cope with my pain. I worked a job that demanded more from me than I was capable of giving at the time and it is was high stress, constant crisis. I was dangerously close to snapping and didn’t know it. I went on a road trip with a friend and by divine timing, we ended up in Moore, Oklahoma exactly at the same time as the 2013 tornado did. We went into the bathroom at the corner store, and came out to destruction. I had never been in a tornado before this and I was completely freaked out. The tornado I believe saved my life because it was a physical manifestation of what my life had become. I weighed about a hundred pounds more than I do now and was severely over weight, I drank too much, and I was isolating myself. I lost two very important friendships on this trip, and knew I had to make some changes. I quit drinking shortly after this trip in July of 2013 and have been sober for three years since then. I also was a chain smoker starting at age 12 and remained that way for 29 years. I quit smoking shortly after I lost my best friend to cancer; the catalyst that lead me to abusing alcohol to cope. I knew I had to replace these destructive behaviors with new habits so I delved into working out every day and full time school. I started by walking and I now dance, teach Zumba, run, lift weights and swim. I remember the first time I ran 10 miles, I cried because years ago, I was in Jamaica in a dangerous situation that required running to get away from it which I couldn’t do because I smoked too much and I promised myself that I would one day run so that I could save my life if ever need be. Now if I go one day without working out, I feel like I’ve lost a friend and activity calls to me; it’s a burning inside my soul and I know when I have missed a day. I have run a couple of 5k’s but next year, my goal is to run a half marathon and to be teaching Zumba to children. I cannot tell you how much exercise plays in my sobriety. It has replaced my destructive behaviors and keeps my moods balanced (along with proper nutrition) and brings my joy levels up. Exercise also keeps me busy and focused. I cannot tell you the enormous benefits that being active gives a person, there are so many. I highly encourage anyone to adopt exercise and activity. Especially if you experience depression, chemical dependency, or find it hard to focus. I am so thankful that I have found physical activity and have adopted it as a lifestyle. I hope that you will also find your story of recovery through physical activity. CNN iReporter Brenton Leete took these unbelievable photos of the EF-4 tornado on the ground in Moore, OK on Monday, May 20, 2013. Silent Moon Coaching Services now offers Zumba. If you are looking for fitness in your life along with personal life coaching, Silent Moon will come to your business, community center, school, church or whatever appropriate venue in need. You owe it to yourself and your team to FEEL GOOD ABOUT YOU! Come join the party and schedule your Zumba class today!! Create a wonderful Sunday from passion not regret! Are you ready for change but having a hard time knowing where to begin? Do you have a burning passion that you have always wanted to pursue but you don’t have the time or money to put into manifesting the dream? Are you living up to your fullest potential? What does your life look like when you are sending out the highest vibration that you can imagine? If any of these questions resonate with you on any level, you may benefit from having a personal coach. I am not only a life coach but also a fitness coach. I personally have shed 100 pounds over the course of three years by changing eating habits and exercising more than 3 times a week and I am here to tell you that you can too. Sometimes people get stuck at the first step because they are unsure where to start but they know they want change. By having a personal coach, you will move towards the life that you know is possible and when you are living in your highest potential, you are sending vibrations into your world that resonate higher thusly bringing in higher vibrational experiences into your awareness. Don’t you owe it to yourself to be living your purpose? At one point in my life I thought who am I to be making money by creating art? I don’t want my passion to become my burden. If I make a sole income based on my paintings, then I will be chained to the hobby and lose my passion for it. This notion simply wasn’t true I came to find out. We are given our passions for a reason and when pursuing what we love and becoming producers of what we love, we are living at our highest potential. I urge you to consider having a personal coach to get you heading into the direction of your dreams. I have availability the week of 4/11 thru 4/16. Please call for your complimentary “walk and talk” session. We can coach over the phone or in nature or over the phone in nature. There is no commitment for the initial “walk and talk” but I do require a 3 month commitment if you become aware that a life coach would benefit your life. I have two session times available for this week. Please call me at 612-280-6033 to coordinate schedules. Thank you all. April is right around the corner and brings with it “arboretum discovery sessions”. Discovery sessions are the first place to start if you are designing an alliance with a Life Coach. Typically these sessions run around two hours and come with a packet of what I call “fleshing out your character” pages. We begin with goal setting and other tools that you can learn by setting up your complimentary 15 minute sample session. I design my life coaching around nature, animals and the arts because they are what brings me to life. My goal is to help you transform through these means. Your discovery session will take place in a natural space either selected by you or jointly at an agreed upon time. Give yourself the gift of personal coaching. YOU ARE WORTH IT!!! 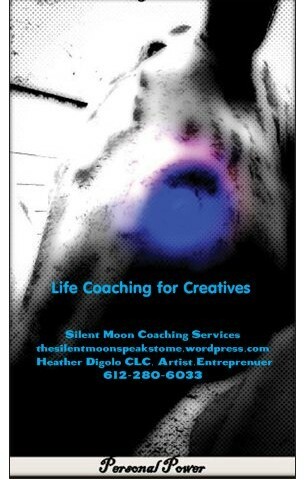 Silent Moon Coaching Services is a nature based, arts based, and animal assisted based Co-Active Life Coaching business. This website is meant for educational and informative purposes and is not liable for harm that was caused by reading any of the content within. All items produced on this site are owned by Silent Moon Coaching Services LLC. Are you finding it harder than ever to schedule time for yourself? How do you show up in your friendships, relationships, and at work? Are you finding it hard to choose which direction to go but know that you need a change? What will you be doing in five, ten and 20 years? If you are at a cross roads in your life and you are ready for change, then Co-Active Life Coaching might be for you. If you are ready to embrace the ideas you have stewing and don’t really know where to start or would like to design an alliance with a coach, please contact me and I will provide a complimentary intro Co-Active Life Coach Session. You will not be required to commit unless you like what you witness, then we can design your coaching plan for you. Please call me at 612-280-6033 to book your complimentary session.